Year in and year out, Champagne delivers excellent quality across the board, and today's wine lovers can enjoy a growing diversity of bottlings as producers push the boundaries of tradition to explore all the region can offer. Champagne: A free chart offers an alphabetical list of all Champagne wines reviewed for the tasting report in this issue. Amarone: A free chart offers an alphabetical list of all Amarone wines reviewed for the tasting report in this issue. FREE: Champagne Alphabetical Listing - More than 355 wines were reviewed for this report. A free alphabetical list is available. WineSpectator.com members can access complete reviews for all the wines tasted using the online Wine Ratings Search. WineSpectator.com: BONUS VIDEOS Learn more about Champagne with senior editor Alison Napjus and the region's most prestigious houses: The art of blending with Krug, how Champagne ages with Dom Pérignon, the distinctions among styles (nonvintage, vintage and tête de cuvée) with Taittinger and the difference between premier cru and grand cru bottlings with Duval-Leroy. Watch these and more. FREE: Amarone Alphabetical Listing - More than 55 wines were reviewed for this report. A free alphabetical list is available. WineSpectator.com members can access complete reviews for all the wines tasted using the online Wine Ratings Search. WineSpectator.com: BONUS VIDEO Veneto Primer: What's the difference between Recioto and Amarone? Learn about the Veneto's top-quality reds with one of the region's top winemakers, Marilisa Allegrini. WineSpectator.com: BONUS VIDEOS Take a dramatic tour of Jackass Hill Vineyard as Lee Martinelli Sr. tackles the treacherous 60-degree slope on his tractor, in our 2015 Video Contest winner. Then meet his daughter Regina as she explains the distinctions between their Pinot Noirs from Sonoma's Russian River Valley and from its even cooler Green Valley sub-appellation. WineSpectator.com: See all 87 Grand Award winners in our 2016 Restaurant Awards program. And by perusing the more than 3,500 award-winning wine lists in our Restaurant Search, you can pick the perfect dining spot by location, award level, wine strengths, cuisine type and more. WineSpectator.com: Keep up with breaking news as well as the people, places and happenings that wine lovers are talking about. WineSpectator.com: Discover more on wine & health. WineSpectator.com: Members can reference our full archives of David Gibbons' columns and other articles about cheese. WineSpectator.com: Members can reference our full archives of Jack Bettridge's columns and other articles about spirits. WineSpectator.com: Members can reference our full archives of Mark Pendergrast's columns and other articles about coffee. WineSpectator.com: Find restaurants with great wine lists in our Restaurant Search. By searching our more than 3,500 award winners, you can pick the perfect dining spot by location, award level, wine strengths, cuisine type and more. WineSpectator.com: Want more from Dr. Vinny? Our advice expert provides saucy answers to all sorts of questions—from tough topics about the technical aspects of winemaking to the finer points of wine etiquette—three days a week on WineSpectator.com. Submit your questions at www.winespectator.com/drvinny or on Twitter via @AskDrVinny. WineSpectator.com: In his blogs, James Laube shares updates from his recent tastings and visits with winemakers, and discusses hot-button issues in the wine industry. Join the conversation with other members. The Buying Guide for this issue is available here. TOP 100 COUNTDOWN On Nov. 28, we begin unveiling the Top 10 wines of 2016—with videos, tasting notes and more—culminating with the Wine of the Year on Dec. 2 and the complete Top 100 list on Dec. 5. Don't miss the year's most exciting wines! Plus, enter our sweepstakes to win the Top 10 wines from 2015. FIND THE WORLD'S BEST WINE LISTS With more than 3,500 award winners for 2016, it's easy to pick the perfect dining spot for your holiday celebration by location, wine strengths, cuisine type, award level and more. Our free online Restaurant Search lets you easily find award winners near your current location, with maps. 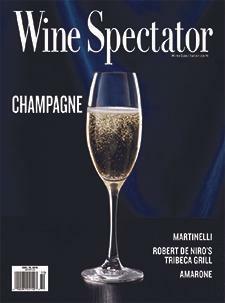 Also at Restaurants.WineSpectator.com, find all our great dining articles in one convenient place: restaurant guides, sommelier and chef interviews, new openings and more. WINE SPECTATOR VIDEO Watch all our wine tips, winemaker interviews and tastings on your desktop, laptop, tablet or phone. Tune in each week for a new mobile-friendly video. Quick Tip: Perfect Pairings With Chianti Classico: As wines evolve over time, their ideal food matches change. Castello di Monsanto's Laura Bianchi shares ideas on what to eat with a young Sangiovese versus an aged one. Quick Tip: How to Pronounce Alsace Grape Names: This French region's wines are delicious, but some of the grape names can be tongue-twisters. Learn how to pronounce them as senior editor Alison Napjus is joined by Jean-Frédéric Hugel. Big on Pinot in the Willamette Valley: Food-friendly Pinot Noir is a popular wine over the holidays, and Oregon has a huge reputation for the grape. Roco cofounder and winemaker Rollin Soles explains what to expect from Pinots from the Willamette Valley and why it's a great place for the variety. RECIPE SEARCH Plan your holiday meal with the help of our pairing tool. Know you want to serve an Italian red? We'll turn up ideal recipes such as homemade meatballs, beef ragù, porcini ravioli and osso bucco. Prefer a Chardonnay? You'll find dozens of salads, seafood and poultry dishes. We've got you covered from starters to sides to sweets. WINE SPECTATOR SCHOOL Get more enjoyment out of the wines you drink with our 10 online courses—all of them included in your WineSpectator.com membership. Learn what to look for in a glass of wine with ABCs of Wine Tasting, develop a deeper appreciation with Understanding Wine, or take a seminar on Wine and Food Pairing. Share the step-by-step tastings with family and friends—a great way to get together over the holidays!